This print commemorates a performance at the Naka Theater in 9/1827. The allusion to the 'spike of frost' is a reference to the young warrior Ushiwakamaru. 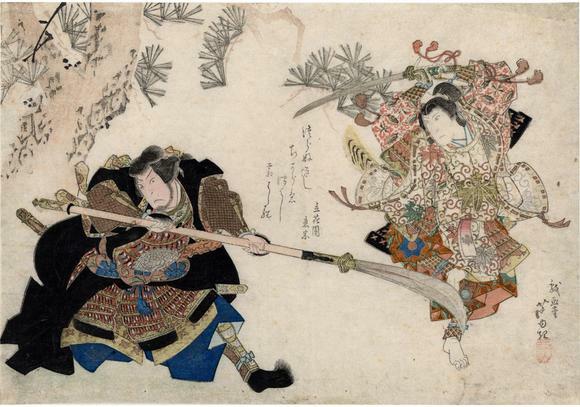 "This particularly fine horizontal ōban print combines a shijō style pine-tree [sic] in the background with the surimono-style printing techniques on the costumes of both actors. Ashiyuki used this horizontal ōban a few times for hsi prints. He was the first artist in Ōsaka to make use of this format, but it never became very popular in this city." "Ashiyuki depicted this scene also on an ōban diptych, published by Honya Seishichi. On it, both actors as well as the pine-tree are placed the other way about compared to the print illustrated here." These quotes are from Ōsaka Kagami 大阪鏡 by Jan van Doesburg, p. 67. Ushiwakamaru was the childhood name of the legendary Genji general Minamoto no Yoshitsune (1159-89). Kumasaka Chōhan was a notorious bandit whose exploits have been popularized for centuries in the folk tales and legends of Japan. Most famous were his attacks against travelers in the Province of Mino, where there was a pine tree approximately 20 meters high from which it was possible to spy upon the unsuspecting and rob them of their luggage and valuables. One day Kumasaka's outlaw band attacked Ushiwakamaru —a lad of sixteen who had run away from the temple where he was being educated and was traveling with a merchant's retinue. He soundly defeated the thugs, displaying astonishing swordsmanship and slaying 13 of them. When Chōhan attempted to dispatch the youth himself, he failed, suffering many wounds as Ushiwakamaru danced and leapt about, easily parrying the blows from his adversary. This legend became the subject of a Nō drama entitled Kumasaka, as well as a popular subject in songs, dances, and kabuki dramas. Ushiwakamaru is depicted leaping away from Chōhan's deadly thrust. In keeping with his age and former lodging in a temple, his hair is styled in a chigo-mage (page's chignon). The large pine used by Chōhan can be seen behind the adversaries, painted in a softer Shijō-school style. The halberd (naginata) held by Chōhan forms an effective graphic element running across the width of the sheet. The poem is signed by Rikkaen and reads Tsuranuki shi / chikara mo tsuyoshi / shimobasgira (a spike of frost pushes through to show its power), an allusion to Ushiwakamaru's youth, which belies his great strength and skill in the martial arts. The two paragraphs above are information taken directly from osakaprints.com. In Masterful Illusions: Japanese Prints in the Anne van Biema Collection it says: "The Minamoto crest on [Ushiwakamaru's] robes and tiger-skin scabbard are immediate clues to his identity." 1) In Ōsaka Kagami 大阪鏡 by Jan van Doesburg, p. 67. 2) In Masterful Illusions: Japanese Prints in the Anne van Biema Collection, pp. 162-163.